Living in Bussum, in the heart of the Netherlands, my heart certainly lies in Africa. The Masai Mara in Kenya is one of my favourite places because of the great variety of wildlife. For years I have been travelling to places like the Masai Mara, but also other places in Africa and India, to see my favourite wild cats, big and small, in their natural habitat. Photography, always a big passion from a very young age, so it was a natural step to start organising Photosafaries to show people the endangered wild cats, and other wildlife, in their natural habitat while we still can. My favourite pets always were cats, so it was very logical to love their bigger relatives as well. I started observing them, not only in captivity but also in the wild, and the more I learnt the more they fascinated me. The next step was to work with these wild cats in sanctuaries, and to support projects fighting for the endangered cats to keep them save in their natural habitat, like cheetah and tigers. To educate people and create awareness I write articles for magazines and websites and I have a lot of contacts with wildlife biologists, camera specialists and people working with/for wild animals. Even though biology was one of my favourite subjects at school, I learnt everything “in the bush”. In 2005 I started the succesful web-magazine “Wild Cats Magazine” with readers in over 140 different countries. 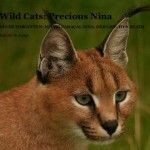 In 2010 I founded the non-profit foundation Wild Cats World, an officially registered (in Holland) non-profit organisation with keywords: Awareness, Conservation and Education. Welfare for all wild cats species in natural habitat and captivity is what we strive for. We have started the project “Spotted Cats Conservation” in South Africa with partner Daniell Cheetah Project and are focusing on leopards, black-footed cats, servals and caracals, but with enough funding we are determined to rescue as many captive wild cats from lives of misery and suffering and support vital conservation work. We have an open organisation, you can follow us every step of the way, and you are all welcome to witness our progress yourself. Photos on this website, copyright by Babette de Jonge, are not to be used without permission. .
Wat een geweldige website dame! Wij zijn gek op dieren. Met name de katachtige vinden we gaaf om te zien! De witte leeuw vind ik echt prachtig om te zien. Wat een goed initiatief van je!